If you have ever wished you had the equivalent of a "Nanny 911" to defuse tensions in the office, your wish has come true. 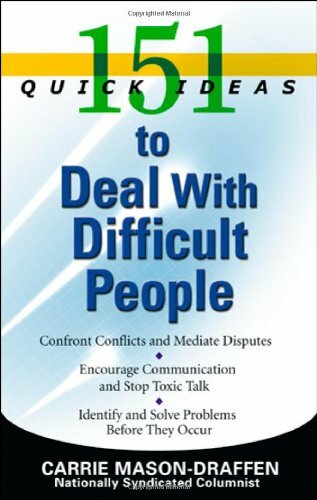 151 Quick Ideas to Deal With Difficult People is the ultimate guide on how to face challenging employees and coworkers. Keep problem employees from setting the tone in the office. Take steps to turn troublemakers into team players. Keep them from demoralizing or scaring away other employees. Avoid hiring troublemakers in the first place. Confront bullies, harassers, and ageists. Keep a backstabber from sabotaging your career. Keep an aggressive colleague from commandeering your meeting. Deal with colleagues who infringe on your time. Because the information in this book is so concise and practical, you'll refer to it again and again. Whether you are a manager or a coworker of difficult employees, the advice will give you the tools to better supervise problem workers or the confidence to stand up to them. You will no longer live in fear of an aggressive employee ruining your day.